Birds are some of the most elegant, graceful creatures on Earth, but even they have moments when their poise falls by the wayside. 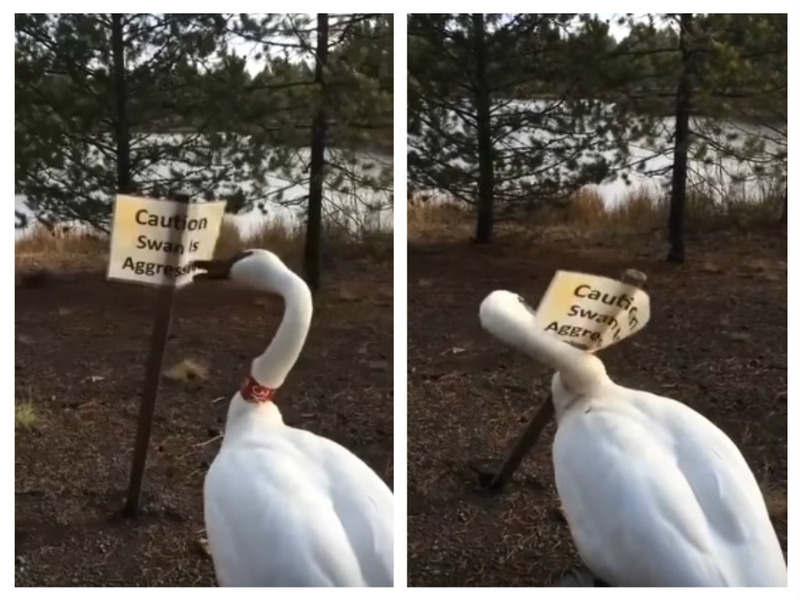 Here to prove our point is a beautiful swan ruthlessly attacking a warning sign about swans. If we were to compile a list of reasons why birds make us nervous, this vicious beaked creature would be near the top, second only to that goose that attacked a police officer because clearly there’s a huge difference between going after human flesh and ripping into a paper sign. Hmm…so could it be that this swan methodically tore into this caution sign because of the egregious grammatical errors? Perhaps it was just having a *really* bad day at the lake or dealing with a sudden onset of extreme hanger. Whatever caused this meltdown, our sympathies are with the swan. We’ve all been there, bird. However, we’re also huge fans of respecting boundaries so if anyone wants to befriend a bird like a real-life Disney princess, just make sure it isn’t this swan.